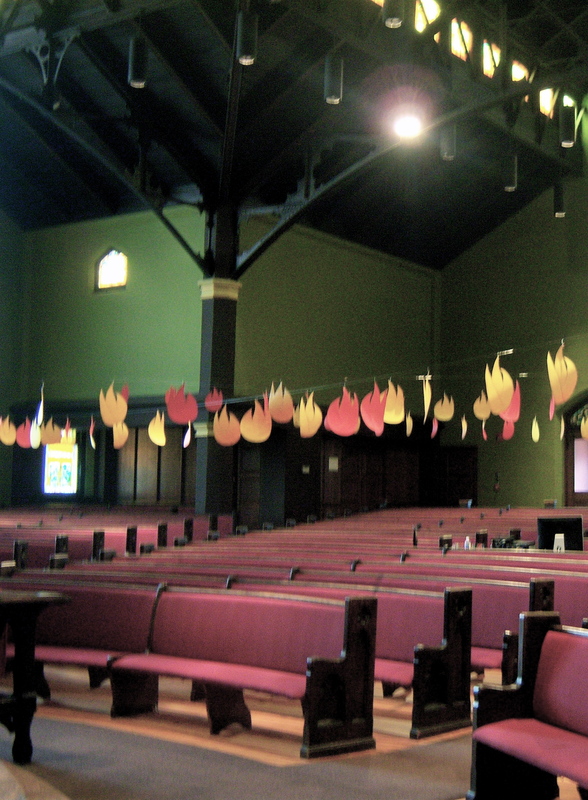 Many churches that celebrate the church calendar recognize “Pentecost” Sunday. This follows the events that unfolded after Jesus rose from the grave. He instructed his disciples to remain in Jerusalem until he would send the Holy Spirit. The disciples followed his instructions and 50 days after the Resurrection the Holy Spirit descended upon the gathered disciples and the church was born in power. You can read this in Acts ch’s 1 and 2. It’s a foundational event for our faith and one we remember and proclaim every Sunday. Celebrating “Pentecost” Sunday can however give you an opportunity to reflect in a deeper and more well formed way the reality of the Spirit’s work in our midst. Below you will find music, art, and liturgies gathered from a variety of churches that celebrate Pentecost Sunday. BCP-Pentecost – Almighty God, on this day you opened the way of eternal life to every race and nation by the promised gift of your Holy Spirit: Shed abroad this gift throughout the world by the preaching of the Gospel, that it may reach to the ends of the earth; through Jesus Christ our Lord, who lives and reigns with you, in the unity of the Holy Spirit, one God, for ever and ever. Amen. The celebration of Pentecost goes back to the Old Testament and finds its origination in Leviticus 23:15. God commanded the Israelites to observe the day after 7 sabbaths (the 50th day) after the Passover as a Sabbath day. Fifty as a biblical number is a sign of completeness and fulfillment and is also connected to the Old Testament theme of the jubilee year where all debts and slaves were forgiven and released (See Lev 25:10; Isaiah 61:1). In Acts 2, The Holy Spirit was sent as a gift and sign to men that Christ had fulfilled his Father’s will and ascended to the throne of heaven (Joel 2:28-32), a gift for all who were caught up in the train of the marriage of the Lamb (Eph 4:8;Rev 19:7). Pentecost reflects on biblical themes of freedom from captivity to sin and death, the Kingdom of God as encompassing all the nations (tongues), and the promise that in the new covenant God would send His Spirit into the hearts of men. A great collection of images relating to Pentecost and other Christian themes can be found at the Pitts Theological Site. Image Courtesy of the Digital Image Archive, Pitts Theology Library, Candler School of Theology, Emory University. Great stuff! Such a gift. Thanks, Bruce.